With a combined population of around 906,000 people, the communities south of the Fraser have much less access to close-to-home higher education than do those north of the Fraser. Simple math shows that Surrey, Langley, Delta, Richmond and White Rock have just one post-secondary spot per 34 residents, while Vancouver, Burnaby, the Tri-Cities and the North Shore have a much lower ratio at 12 resident per available post-secondary spot. Of course, many ‘southern’ residents commute to those campuses, but when we see that Surrey is now about two-thirds the size of Vancouver, should we have more than one mid-sized campus and one small affiliate campus serving our residents? The ongoing construction of SFU Surrey’s Podium 2 project will eventually lead to 2,500 more students attending classes (pdf) at the city centre campus. There are three other projects on the table, that, if completed, would add a further 2,500 students to the campus. The next building project, for Science, Health and Technology, is hoped to be completed by 2015. The subsequent projects, for business and graduate studies, have hoped-for completion dates of 2016 and 2017. Kwantlen is finishing up a renovation of an old trades building. The new building will house classrooms and other amenities, allowing for more students to attend classes at the Langley campus. However, both of these expansions will still leave the region somewhere in the range of 80,000 fewer student spaces than exist north of the Fraser. 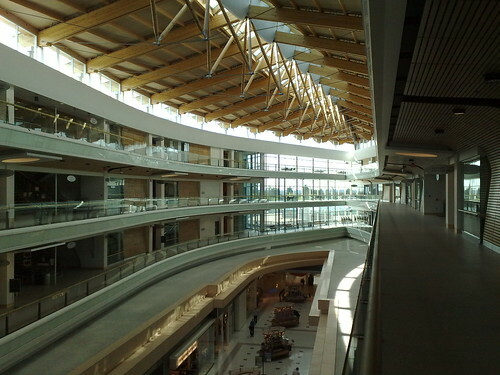 To get Surrey to a ratio approximately similar to the north-of-the-Fraser number, another 40,000 spaces would need to be found. Given that the provincial government recently announced it will be slashing funding for higher education, don’t hold your breath on any good news for those 40,000 spaces anytime soon.